Cajun Comfort – Eat. Drink. Smile. Last night hubby and I had to do some Steeplechase shopping, so we took a trip down to Cool Springs, and after a painful excursion to Wal-Mart (seriously awful) we rewarded ourselves with some comfort food from the new Cajun Steamer Bar & Grill. I’d heard alot of good things, but tried not to get my hopes up too much. Happy to say it lived up to the hype. 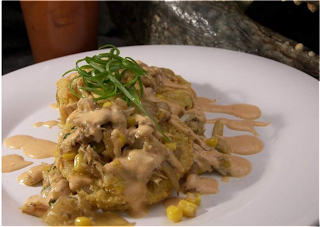 To start, we had the Fried Green Tomato appetizer- 3 tomato slices with perfectly crisp breading topped off with blue crab, caramelized onions, corn and a drizzle of remoulade. In a matter of minutes there was not a speck of food left on the plate. Next came the hard part- deciding on an entree. The menu is pretty long, and so many things looked yummy, but my eyes just kept wandering back to the Shrimp & Grits. The last time I had shrimp & grits was at Radius10 several months ago and after watching a recent episode of Bobby Flay’s Throwdown, I’ve had quite the craving. Jackpot! The cheese grits were decadent. Heaven in a bowl. Thick and creamy, loaded with jumbo sauteed shrimp, studded with tasso ham and tiny bits of jalapenos. As much as I loved Jason Brumm’s low country dish, I swear, I think these are just as good, and they are about 1/2 the price! Hubby went for the Catfish Ponchartrain, a broiled catfish fillet filled with shrimp and crab stuffing topped with a Crawfish Louie sauce and a side of crawfish etouffee. Lots of head nods and “mmmmm”s coming from him signified happiness. The best part was that the portions are very generous, which meant we both had some left over to take home for lunch the next day! After my fabulous meal, I’ve now decided to embark on a quest for the best cheese grits. Next up Bobby Flay’s grits at his Bar Americain restaurant in NYC. Anyone know of any other grits I should add to my “Must Try” list? After having the shrimp and grits at your wedding, I haven’t been able to get rid of my craving for them. I had the shrimp and grits at Truluck’s in Dallas in March and haven’t stopped talking about them since! Yummmy, yummy! Other locations in Austin, Houston, CA and FL. Yum! truffled corn sauce? I would lap that up! My rule of thumb is, if it has word truffle in it, I’m ordering it. love this blog. great reviews and informative information. I have been meaning to try the crawfish at this place before the season is over.